NEW PRICE!!! NOTE TAX RECORD SQ FOOTAGE IS OUT OF DATE. Fantastic 1610-sq ft, move-in ready home blends historic detail and stylish updates. 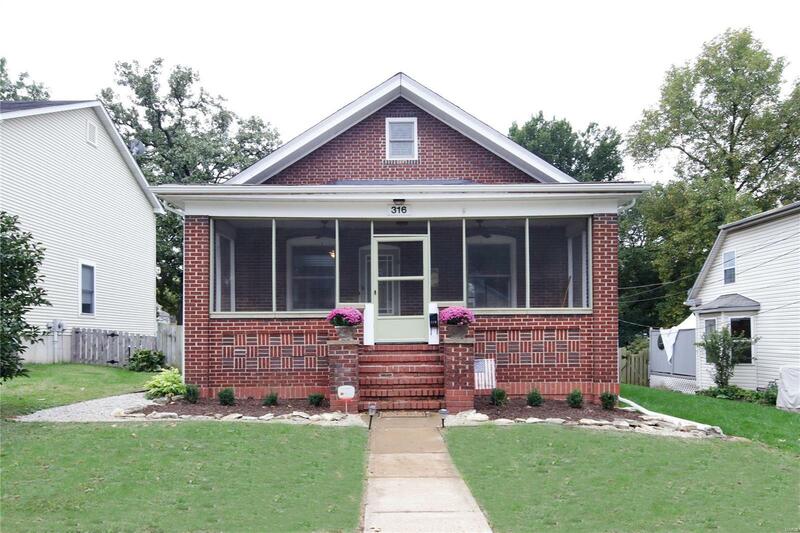 Set on a charming block in Webster Groves, the screened porch, with hardwood floors & ceilings sets the tone. Inside, a large living-room and dining room, with newer hardwood floors & vaulted ceiling, will surprise and delight. The ultra-cool kitchen has stainless steel back splash & appliances, 42" cabinets with distressed espresso finish and granite countertops. Flexible floorplan includes an updated full bath with claw tub & separate shower, roomy bedroom & main level laundry. Upstairs, two bedrooms with hardwood floors and a second full bath with shower will impress. Walkout lower level has storage & rec room with some finish. The landscaped backyard is fenced, & a detached 2-car garage 220 am srvc & workshop is nearby. Newer windows, roof and ceiling fan make this a move-in ready opportunity just minutes from Webster schools and retail. Copyright 2019, Mid America Regional Information Systems, Inc.(MARIS). All rights reserved. RealtyNET McLain, Realtors does not display the entire IDX database of Mid America Regional Information Systems, Inc. (MARIS MLS) on this web site. Property listings of some REALTOR® brokerage firms have been excluded. Listings displaying the MARIS logo are courtesy of the participants of Mid America Regional Information Systems Internet Data Exchange. Information provided deemed to be reliable but is not guaranteed to be accurate. Buyers are advised to verify all facts before making a decision on purchasing a property. No warranties, expressed or implied, are provided for the data herein, or for their use or interpretation by the user. Mid America Regional information Systems, Inc. (MARIS) will not be held responsibility for the content of such records. Last Updated On: 2019-04-22.